When I pore through the Diamond catalog each month, every so often something jumps out and hits my sweet spot: the perfect blend of nostalgia, sci-fi, and good old-fashioned geekiness appears right before my eyes! 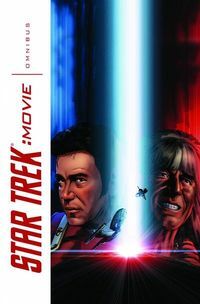 In the September catalog, it was IDW’s Star Trek Movie Omnibus. Six Star Trek movie adaptations in one graphic novel? Perfect. It’s a portable movie marathon–ideal for road trips, long plane rides, or rainy Saturday afternoons. I’m in. Included are two three-part miniseries, Star Trek: The Motion Picture and 2009’s Star Trek: The Wrath of Khan, and then there are one-shots adapting Star Trek: The Search for Spock, Star Trek IV: The Voyage Home, Star Trek: The Final Frontier, and Star Trek: The Undiscovered Country. I think I’m most excited to see the Star Trek gang hanging out in the ’80s with the whales. Dude! The Star Trek Movie Omnibus is out November 25 (a week after the new Star Trek movie comes out on DVD), but you can pre-order it for 20% off: just $19.99! That’s cheaper (and easier) than running out and renting all six movies. Plus, no late fees! What do you think of IDW’s Star Trek comics? Are they worthy of the series? Post your comments below! X Marks the Spot: Celebrate Milestones in the X-Men Universe!